Every summer, on the last day of Staff Training, we have the naming ceremony. Now the goal is to pick a name that reveals something about that person. Sometimes we get carried away and names just end up being fun. I was named Boo Boo because I was so cautious and needed to follow all of the rules all of the time. Boo Boo Bear is always cautious about Yogi’s picnic basket schemes. “I don’t know Yogi, the Ranger wouldn’t like it” and thus my name was born. Scruffy showed up as a camp speaker with very very torn jeans, ripped shirts, and a tattered flannel. And then there was Rambo. Someone suggested “Rainbow” but the director misheard and she was Rambo from then on. But once in awhile all does go as planned and a moment of magic occurs. Once in a while the name is so perfect that no one contests it. Everyone stands back amazed. This summer that moment occurred with one of our guy C.I.T’s. He sat on the stool in the middle of the staff while several good names were suggested. Then Scruffy suggested a name: Orion. Huh, it was a fine name, time to move on. But then he explained his selection. Orion was a comic book character. There were two warring planets. One evil and one good. In order to save their peoples and bring peace, the leaders of the planets exchanged their sons. The prince of the good planet went to live in darkness. The prince of the evil planet went to live in light. He stepped out of a dark and violent world and was raised by a man of peace. He left the hopelessness of his heritage behind him and became a superhero on the good planet. His name was Orion. The C.I.T. boy sat there looking at Scruffy, knowing that he knew his story. You see, this young man was part of the foster care system, a lost child, passed from place to place, until he was adopted and given a home. He came to camp as a hurting camper trying to put a finger on exactly who he was and where he fit in. But he came back and chose to be a counselor, to walk forward out of the darkness of his past, and to give of himself to others. Then they named him Orion. I just wanted to post a few pictures from last weekend’s Labor Day work retreat. This is the new roof for the new camp generator. 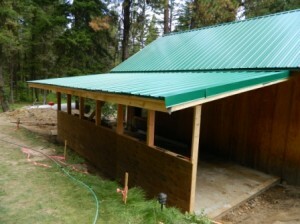 It was built this weekend through the hard work of one of our board members, John Nason. 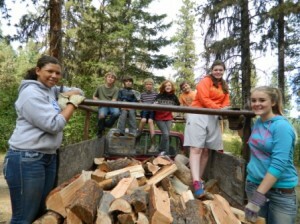 Here is the young wood crew. They transport and stack the pieces that the older wood crew are busy splitting. 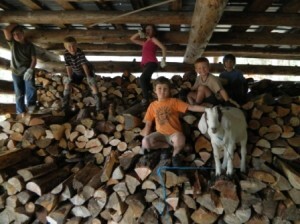 My boys and I were goat-sitting for my brother and this little goat loved to help out. Here he is climbing the woodpile with the “kids”. A huge thank you to everyone who came up and helped out. Camp would not be here if not for you!